Blaze TrayAudio is very powerful media player for enjoying all of your favorite music and audio files. 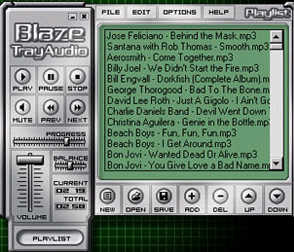 Blaze TrayAudio is a media player with advanced features such as easy playlist(s) creation, randomize playlist, loop playlist, auto-load of playlist, dialog previewing, skinnable interface, save as HTML, remove non-existing files, the ability to hide/show playlist, and more. TrayAudio can play your selected playlist (audio files) in the background while you work on other tasks, out of your way, and taking up very little system resources. Blaze TrayAudio can handle the most popular sound formats, including: MPEG Audio Layer-3 (mp3), MPEG Audio Layer-2 (mp2), Microsoft Windows Media Audio (wma), CD Audio Track (cda), Active Streaming Format (asf), Waveform Audio (wav), Audio Interchange Format (aif, aiff), SUN Microsystems Audio (au), Musical Instrument Digital Interface (mid, midi, rmi), Macintosh Sound Resource (snd), Raw Unsigned PCM Data (various extensions), audio playlists, and more, including other variations and less common formats. Blaze TrayAudio can play one or more selected songs, or an entire playlist. You can easily create and save playlists of your favorite songs for convenient access later. You can even save playlists as HTML files. Blaze TrayAudio supports playlist loop and randomize features, and can scan playlists to remove duplicate files or those that no longer exist. The Blaze TrayAudio interface is easy-to-use, giving you buttons for the most commonly used features, controls, and indicators. Like any good music player, Blaze TrayAudio lets you play, seek, pause, stop, and skip to the next or the previous song. It also has a handy volume control slider, mute button, balance control, and progress tracker. When a song is playing, its duration and elapsed time are displayed. You can have Blaze TrayAudio display in a compact mode by hiding the currently loaded playlist. The interface is skinnable, so you can get a look that suits your personal taste. Click Here to download the skins.When Blaze TrayAudio starts playing, it will automatically minimize to the system tray where it's out of your way. In this way you can go on with your work or play while enjoying the desired audio playback. You can easily access the most commonly used features by simply right-clicking on the Blaze TrayAudio icon in the system tray and selecting the desired command. With its advanced features, easy-to-use interface, and customizable options, Blaze TrayAudio is just what you've been searching for, and more!